Review: James Bond is sent to stop a diabolically brilliant heroin magnet armed with a complex organisation. It also comes with a reliable psychic tarot card reader. This is only the second James Bond novel to be written by Ian Fleming but only partially based on the novel. Will start off by saying outstanding performance from Roger Moore and what a great way for him to enter as this is his first Bond film. Brilliant action sequences. I love the hi-tech gadgetry. Talking about the gadgetry Roger Moore’s favorite gadget was the magnetic wristwatch. Fantastic song by Paul and Linda McCartney. Sean Connery was down to play Bond again but turned the role down. He would have got $5.5 million for the role. 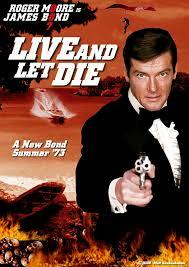 When Roger Moore took on this role he was already aged 45 years which made him the oldest actor to play Bond. Clint Eastwood was asked to play Bond but declined. The only character to ever beat James Bond in a card game is Solitaire. Two more of the Bond films that feature the word “Die” in are “Die Another Day” 2002 and also “Tomorrow Never Dies” 1997. As great as this Bond film is this is not one of the classics. When Roger Moore got the part of Bond his home telephone number in the last few digits ended in 007. Director Guy Hamilton sadly passed away at the start of 2016 but will always be remembered as a great director.